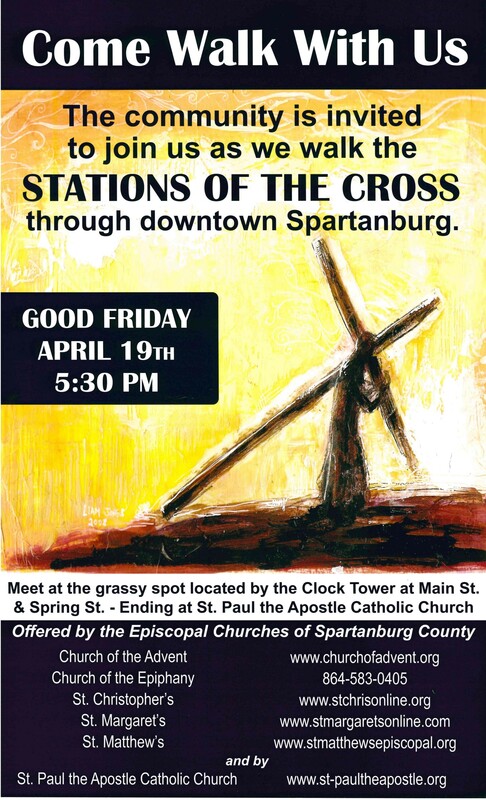 5:30 PM: Community Stations of the Cross – Meet downtown at the grassy area near the Clock Tower on Main St. Instead of a pancake supper on Shrove Tuesday, St. Christopher’s holds an oyster roast. We partner with St. Matthew’s Episcopal Church. Offerings are oysters, cold boiled shrimp, hot dogs, clam chowder, baked beans, and coleslaw. Tickets are required for this event and are sold at each church. The money raised from ticket sales is split between the two churches and is the main source of fund raising for our outreach programs. This powerful event takes place on Good Friday each year. St. Christopher’s, along with the other local Episcopal churches as well as some other denominations, walk through Downtown Spartanburg taking turns carrying a wooden cross, stopping at 12 spots for scripture readings on a journey with Christ to his crucifixion. The journey ends with a short service at The Episcopal Church of the Advent. The Sunday afternoon closest to October 4th, in celebration of St. Francis of Assisi, St. Christopher’s holds a blessing of the animals. Everyone is encouraged to bring their pets to this service held on the lawn next to the church, where they will be blessed by our vicar and deacon. Each year at Spartanburg High School’s Homecoming, St. Christopher’s sets up a mini carnival for the children waiting for the parade to come by. There are several bouncy houses for the little ones to enjoy as well as pizza, Chic-Fil-A, popcorn and water offered to enjoy during the wait. Bring your own chairs and blankets. A quiet and contemplative service is held each Veteran’s Day in the church with the lighting of candles in honor and remembrance of the Veterans in our lives. A Labyrinth made out of American flags is installed in the lawn next to the church for people to walk while praying. 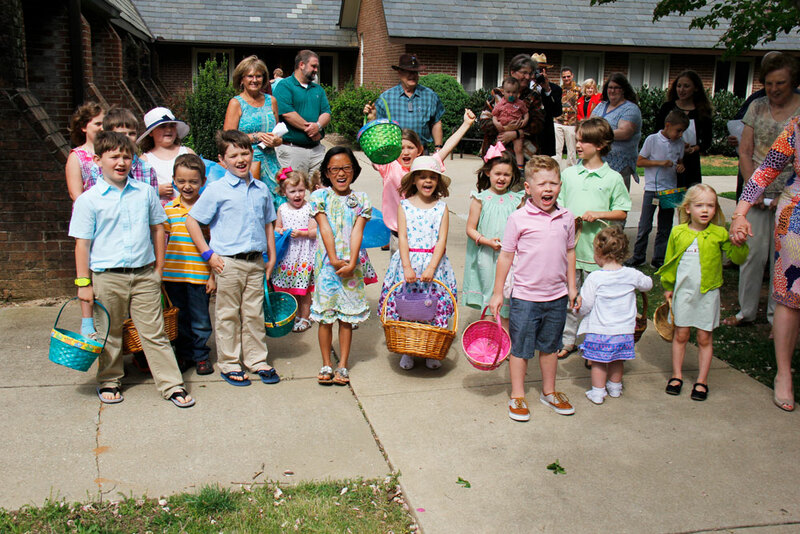 After the Easter service, young children gather with their baskets and join in on an Easter Egg Hunt. The Sunday before school starts back, St. Christopher’s holds a blessing of the backpacks during the service. Students, teachers and others who work at or attend school bring their backpacks to church and receive a blessing before the start of a new school year.